Nature Travel is excited to offer specially tailored tours to the Holy Land during the Christmas 2012 and Easter 2013 seasons. These tours include all the major Holy sites. Meet and assist at Queen Alia Airport. Meet your Jordanian guide and board air conditioned bus to Madaba, the city of Mosaic. Continue to visit Mt. Nebo, where Moses viewed the Promised Land before he died. Continue to Petra for dinner and overnight at hotel. 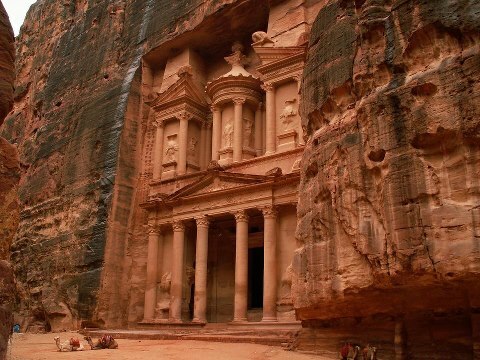 After breakfast proceed to your full day tour to Petra: a rose-red city “half as old as time”. The place in the dessert that is preferred by God for the Jewish people. Also experience a horseback ride through the picturesque SIQ and visit the Treasury, a rose colored monumental building artfully carved out of sheer rock. Transfer to Amman, continue to the hotel for dinner and overnight. After breakfast we cross the border into Israel and stop at Jericho for a view of the Mt. of Temptation and the sycamore Tree. Continue into the Yardenit for a Renewal of Baptism. Then we proceed to Tiberias for dinner and overnight. Breakfast at the hotel, morning cruise at the Sea of Galilee where Jesus performed some of his miracles such as when he walked on the waters (Mark 6:48) The cruise offers an opportunity to reflect on the messages of our :Lord as we savor the beauty of nature while sailing at the Sea of Galilee. Proceed to Capernaum, where Jesus lived after he left Nazareth. Here Jesus preached to the people and manifested His goodnesss and omnipotence by many Miracles. Capernaum was the home of St. Peter. Proceed to the Greek Orthodox Church and the nearby Archeological Excavations of the Synagogue and community. After breakfast, drive across to the Galilee then across the valley to Mt. Tabor, continue to visit Nazareth, the place where Jesus spent His childhood; the Church of Annunciation, in the heart of Nazareth, which was believed to be where the Angel Gabriel announced to the blessed Mother of Christ which She humbly accepted. “Behold I am the handmaid of the Lord May it be done to me according to your word “ and to Mary’s well. Drive to Cana to visit the church of the First Miracle known also as the Marriage Church; here couples will have an opportunity to renew their marriage vows. Ascend by taxi to the Church of Transfiguration. On the way visit the port city of Haifa, and the Stella Marris Church and the Bahal Shrine and Gardens. If time permits view Caesarea, the aqueducts of the crusader city. After breakfast drive to Bethlehem, the birthplace of Jesus, and visit the church of the Nativity where we find the Grotto of Nativity and Altar of Christ’s Birth and Manger’s square. Then in the afternoon we will start our appreciation of the Holy City of Jerusalem with a visit to the Mount of Olives, for a panoramic view of the City. Ascension Chapel – traditional place where Jesus ascended into heaven, then Paster Noster Church traditionally the site where Jesus taught the disciples how to pray “Our Father”. Then, Dominus Flevit Church in memory of Jesus weeping over the fate of Jerusalem. Visit the Church of Ascension and walk the Palm Sunday Route down the hill of the garden Gethsemane for an intercessory prayer; it was here Jesus spent his last night before he was arrested. After the “Last Supper” Jesus retired to this garden to pray with his disciples. Basilica of Agony stopping along the way of the Maria Magdalena Church. Visit the Church of All Nations at the Gethsamane. Drive the Nearby Mount Zion and visit the Last Supper room and the Tomb of King David. Visit the Dormition Abbey – traditionally the site of Virgin Mary slept last and St. Peter’s Church in Galicantu – traditional site where St. Peter denied Jesus walked, talked and denied with two of hid disciples, Cleophas and Simon. Return to our hotel for dinner and overnight. After breakfast. Proceed for a morning tour of Jerusalem’s Old City. Starting from the St. Stephen’s Gate (the Lion’s Gate). Stopping at the St. Anne’s Church – regarded as the birthplace of the Virgin Mary and the home of St Anne and Joachin the Poll of Besthesda, where Jesus told the lame man to take up his bed and walked. Reflect while following the Way of the Cross (Via Dolorosa) ending of the church of the holy Sepulcher – the burial place and resurrection of Jesus. It was built over the site of the place called Golgotha, which means “a Place of Skull”. The eighteen step staircase located just to the right as one enters the Church of the Holy Sepulcher that leads up to Calvary. Continue for the visit of Cardo and Jewish Quarter before arriving at the Western (Wailing) Wall, the last vestige of the second temple, where Jesus all over the world gather to commemorate the destruction of the first and second temple and pray for Israel’s restoration. In the late afternoon, tour of Ein Karem the birthplace of St. john the Baptist and the church of Visitation, where Mary came after the Angel Gabriel informed her cousin Elizabeth was six months pregnant despite her advanced years. Return to hotel for dinner and overnight. After breakfast continue to Qumran for a tour of the site where the Dead Sea Scrolls were found and then proceed to Dead Sea, the lowest point on Earth, and enjoy the some time of the private beach until transfer to Taba Border to cross to Egypt. Arrive at the border. Meet your guide and driver after passport formalities. Transfer to your hotel in Sinai for dinner and overnight. In the early morning climb Moses Mountain and catch the sunrise (optional). This is where God spoke to Moses. Return to the hotel for breakfast. Visit St. Catherine Monastery (Closed every Friday, Saturday and Sunday). Check-out at the hotel and transfer to Cairo for dinner with belly dancing show. Overnight at the hotel. Old Cairo. Visit the Coptic Church, the altar mentioned is that of the Virgin Mary in Al Muharraq Monastery, a site where the Holy Family settled for more than 6 months and the altar stone was the bed upon which the infant Savior lay. Proceed to a site where Church of the Holy Virgin Mary “Hanging Church” built in the 4BC. Al Muallaqa (Hanging Church) dedicated to Virgin Mary, Patriarchal See of the Coptic Church in the early centuries. The Church of St Barbara. The Church of the Virgin, identified by its alternative name Qasriet Al Rihan (Basil Pot), the Coptic Museum and the ramparts of the Fortress of Babylon. The Jewish Synagogue of Ben Ezra. The Church of Abu Serga and the Crypt of the Holy Family beneath it. Overnight in Cairo. The Holy Family at Basta Town. Tel Basta – or Basta – is a short distance from Zagazig, the main town in the Sharqiah Governorate, about 100 kms north-east of Cairo. Here, Jesus caused a water spring to well up from the ground, and His presence caused the idols to crumble, as foretold by the prophets of old. The townsfolk, in consequence, turned malevolent and aggressive, whereupon the Holy Family turned their backs on the town and headed southwards. In due course, they reached Mostorod (which came to be called, in those days, ‘Al Mahamma’) only about 10 kms away from Cairo. ‘Al Mahamma’ means ‘the Bathing Place’, a name given to the town because the Virgin Mary bathed the Christ Child and washed his clothes. It is worthy of note that, eventually, on their way back to Palestine, the Holy Family stopped once more at Mostorod and, this time, caused a spring to gush from the earth which still flows forth to the present day. From Mostorod, the Holy Family made their way north-eastwards to Belbeis (ancient Philippos), back in Sharqiah Governorate, and at a distance of about 55 kms from Cairo. They rested there in the shade of a tree which came to be called, “The Virgin Mary’s Tree”. Overnight in Cairo hotel. After breakfast at the hotel start your half day sightseeing. 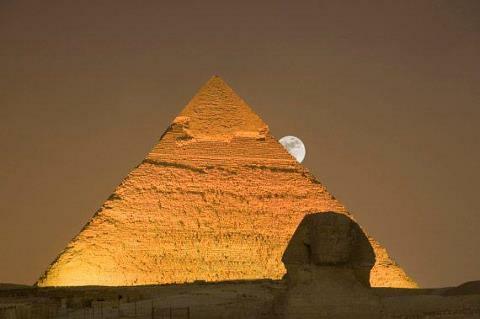 Visits the great Pyramids which were constructed over 4,500 years ago and show us the power and wealth of the Pharaohs in the Old Kingdom, and Sphinx of Giza, which was believed to be a form of a Sun God and was worshiped in ancient days. After breakfast, free time. Then transfer to airport for flight.